Australia, with its population of 20-something million, produces enough food to feed around 60 million people, yet 2 million Australians rely on food relief every year (DAFF, National Food Plan 2012). I’m sure this statistic holds true in other countries too. OzHarvest, Australia’s leading food rescue organisation, plays a key role in ‘Nourishing Our Country’. What I really admire about OzHarvest is that their mission isn’t just about feeding the homeless and others in need, but it’s also about rescuing produce that would otherwise go to waste. I was recently lucky enough to spend a morning in the OzHarvest kitchen – cooking up a storm with tons of donated produce at one of their ‘Cooking for a Cause’ volunteering events. It’s the second time I’ve participated and I’d highly recommend it for anyone in Australia looking for a fun way to give something back. With the help of friendly professional chefs myself and fellow members of my work’s wellbeing team whipped up 100s of meals – that were to be distributed later that day. Having moved to a pretty much vegetarian diet last year I was excited to get involved in making a vegetarian lentil Shepherd’s Pie. Until then I’d always thought of lamb as the hero ingredient of Shepherd’s Pie. But I’m now convinced that this pie can be just as hearty and delicious without meat. 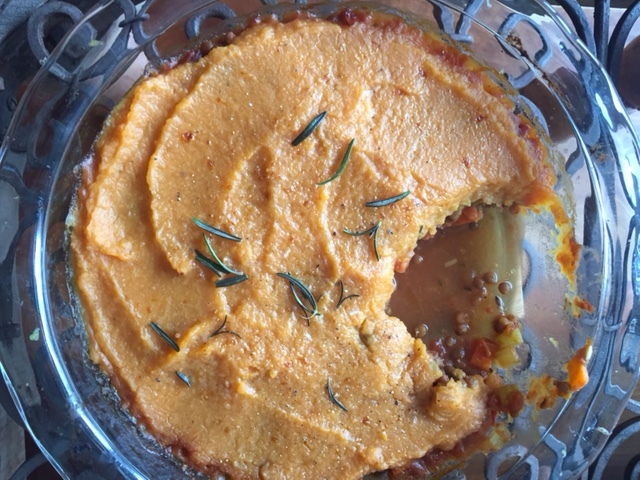 I’ve since made the OzHarvest Lentil Shepherd’s Pie recipe a few times at home and I’m pleased to be sharing the recipe here. As you can see my pie has a lighter sweet potato topping rather than a more traditional one with potatoes, butter, cream and milk. I simply cooked and then blended the sweet potatoes, and topped the pie with parmesan. With Winter fast approaching in Sydney this pie will be a regular in my kitchen. As a nation Australia wastes four million tonnes of food each year (it ends up in landfill), yet two million people per year still rely on food relief and food relief agencies can’t meet demand. Founded in November 2004, OzHarvest is a food rescue organisation that collects quality excess food from commercial outlets and delivers it to 100s of charities – providing much needed assistance to vulnerable men, women and children across the country. Tags: lentils, recipe. OzHarvest, Shepherd's Pie, vegetarian. Bookmark the permalink. Wow, thanks Laura! Great article and would love to volunteer with my vegan daughter as a way of giving back. Cheers! Thank you – and yes have a look at volunteering opportunities with OzHarvest – such a fantastic cause! Great idea to top it with sweet potato! I do love lentils. 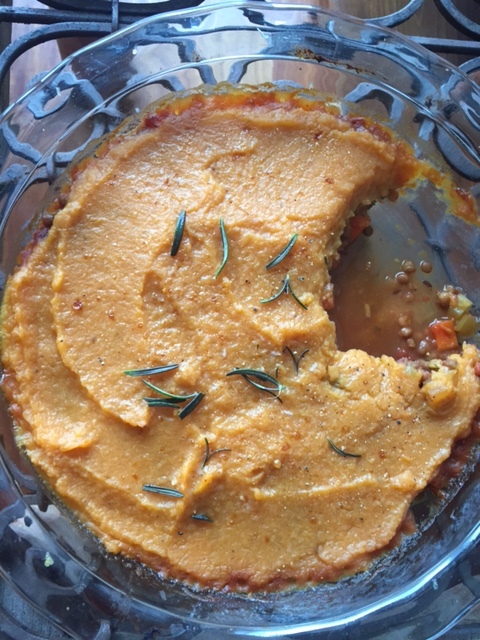 Another great recipe Laura and what a fulfilling cause! Brilliant post! Loved that idea of sweet potato toping instead of potatoes. And a beautiful article Laura!! Thanks for this post. I’ve made veggie shepherd’s pie before with chickpeas but this seems very nice. I’ve enjoyed reading so many of your posts as a subscriber to your blog. I’m wondering if you’d be willing to become a regular reader of my blog: http://christinanifong.com. I’d love for you to follow along on WordPress.com and/or sign up for my weekly email newsletter here: http://christinanifong.com/2017/04/stacking-up-a-satisfying-salad/. The signup box is on the righthand side. Thanks for considering! Thanks Christina – I do believe I already follow your blog too but I’ll double check! Thanks so much for the follow, Laura. Love having another whole-food, plant-based, from scratch blogger to share with! yes please 🙂 And what a great organization. Good for you for sharing your gifts! Nice rendition of classic comfort food! !